Rite Aid Alkaline Battery, 9V, 1 Pack - Lot of 6! NEW! All are in new condition, still in original sealed packaging! Never been opened/used! Please note this listing is for six Rite Aid Alkaline Batteries! (Shelf B44) Long Lasting Battery Made from 100% Recycled Paperboard Maximum 35% Post-Consumer Content Respect For The Environment Please pay attention to the pictures to make sure this is the item(s) you are needing/wanting! Sometimes items can vary! ; Pictures are important! When shipping item you need to ask for insurance. I will gladly add insurance for you. Just ask for the insurance before paying. 2 pcs 9V Alkaline Battery. Chemical : Alkaline MO2. Size: 9V / PP3 / BLOCK / 6LF22. Chemical Composition : Alkaline. 9V Battery. 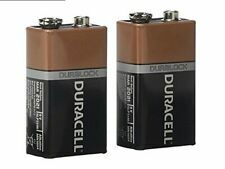 2 NEW RoHS 6LF22 9V PP3 Alkaline Battery Single Use. (A) other Alkaline battery. Lithium Battery 9V (E-Block) for smokedetector (3 pcs.). ANSMANN 10-year long-life battery, specially developed for smoke detectors, 9V PP3 (6LR61 style). Product content 3x 9V E-Block Lithium Batteries. Size: 9V / PP3 / BLOCK / 6LF22. 4 pcs 9V Alkaline battery. Chemical : Alkaline MO2. Remove active content. in good condition before dispatch. Average weight: 44.0g. We will assist you in any way possible and aim to answer. Size: 9V / PP3 / BLOCK / 6F22. 24pcs 9V Carbon-Zinc Battery. Low cost primary battery solution. Remove active content. Average weight: 34.0g. Size: 9V / PP3 / BLOCK / 6LF22. 6 pcs 9V Alkaline battery. Chemical : Alkaline MO2. Remove active content. in good condition before dispatch. Average weight: 44.0g. We will assist you in any way possible and aim to answer. Size: 9V / PP3 / BLOCK / 6LF22. 16 pcs 9V Alkaline battery. Chemical : Alkaline MO2. Remove active content. in good condition before dispatch. Average weight: 44.0g. We will assist you in any way possible and aim to answer. Size: 9V / PP3 / BLOCK / 6LF22. 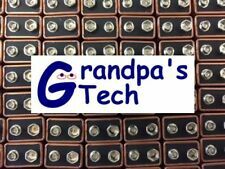 40 pcs 9V Alkaline battery. Chemical : Alkaline MO2. Remove active content. in good condition before dispatch. Average weight: 44.0g. We will assist you in any way possible and aim to answer. Size: 9V / PP3 / BLOCK / 6LF22. 12 pcs 9V Alkaline battery. Chemical : Alkaline MO2. Remove active content. in good condition before dispatch. Average weight: 44.0g. We will assist you in any way possible and aim to answer. Size: 9V / PP3 / BLOCK / 6LF22. 20 pcs 9V Alkaline battery. Chemical : Alkaline MO2. Remove active content. in good condition before dispatch. Average weight: 44.0g. We will assist you in any way possible and aim to answer. Size: 9V / PP3 / BLOCK / 6LF22. 24 pcs 9V Alkaline battery. Chemical : Alkaline MO2. Remove active content. in good condition before dispatch. Average weight: 44.0g. We will assist you in any way possible and aim to answer. Size: 9V / PP3 / BLOCK / 6LF22. 32 pcs 9V Alkaline battery. Chemical : Alkaline MO2. Remove active content. in good condition before dispatch. Average weight: 44.0g. We will assist you in any way possible and aim to answer. Size: 9V / PP3 / BLOCK / 6LF22. 8 pcs 9V Alkaline battery. Chemical : Alkaline MO2. Remove active content. in good condition before dispatch. Average weight: 44.0g. We will assist you in any way possible and aim to answer. 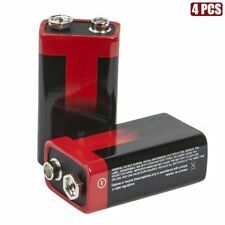 2 pcs 9V Alkaline battery. Chemical : Alkaline MO2. Size: 9V / PP3 / BLOCK / 6LF22. Remove active content. in good condition before dispatch. Average weight: 44.0g. We will assist you in any way possible and aim to answer. Size: 9V / PP3 / BLOCK / 6F22. 18pcs 9V Carbon-Zinc Battery. Low cost primary battery solution. Remove active content. Average weight: 34.0g. Size: 9V / PP3 / BLOCK / 6F22. 20pcs 9V Carbon-Zinc Battery. Low cost primary battery solution. Remove active content. Average weight: 34.0g. Size: 9V / PP3 / BLOCK / 6F22. 26pcs 9V Carbon-Zinc Battery. Low cost primary battery solution. Remove active content. Average weight: 34.0g. Size: 9V / PP3 / BLOCK / 6F22. 10pcs 9V Carbon-Zinc Battery. Low cost primary battery solution. Remove active content. Average weight: 34.0g. Size: 9V / PP3 / BLOCK / 6F22. 8pcs 9V Carbon-Zinc Battery. Low cost primary battery solution. Remove active content. Average weight: 34.0g.